The bathroom shower determines the overall effect and look of the entire bathroom. Your bathroom can come off lacking in style, creativity, and confidence if it is minimal and unadorned. On the other hand, if you have a bold and colorful shower, then your bathroom can convey an air of luxury and extravagance. Given the chance, most homeowners would definitely go for a luxury bathroom shower, as it is designed not just to be functional and reliable but stylish as well. Although it may really be expensive, its price should never be an issue since it is made with state-of-the-art technology and durable, high-quality materials. A luxury bathroom shower is available in a great selection of styles and designs. The latest models usually feature a steam bath, shower jets, a built-in tub, ceiling rain, foot massagers, massage jets, seats, and even a hands-free telephone system. It is commonly installed in big houses, hotels, resorts, day spas, and gyms. If you are thinking about having a luxury bathroom shower installed in your home or place of business, the following photos and descriptions should help you get an idea on which model to purchase. A round corner bathroom shower is designed to be installed in one corner of the bathroom. It features a semi-round design, making it a functional, space-saving structure. It can come in an easy-to-install closed or open design. A closed model includes a clear or semi-transparent glass door and a few glass sidelights. It can be made with body spray jets with flow control adjustability. It is a very durable bathroom shower, but it requires constant cleaning and maintenance to ensure long-lasting use. A round corner bathroom shower is ideal for making a small bathroom look elegant and stylish. 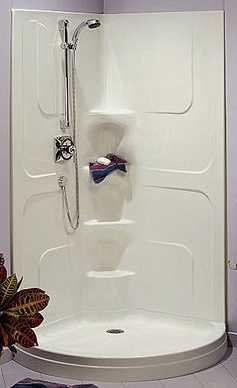 A steam bathroom shower is designed with a built-in steam system for a more relaxing and comfortable shower experience. It features several massage jets that allow pressure, temperature, and direction adjustment. It has a relatively standard shape and size that can accommodate one to two persons. Its rectangular design can be easily installed on the side or a corner of the bathroom. It is made with a glass door and walls that effectively trap heat inside. The other features included in most models are ceiling rain, an integrated foot massager, molded shower seats, an exhaust fan, and a remote control panel. It is ideal for standard to mid-size bathrooms. A bathtub shower combo is a bathtub and shower joined in one unit. It looks like an ordinary bathtub installed with glass walls and doors. Most models are designed with built-in steam systems that provide a more relaxing and comfortable bathing or showering experience. Because of this feature, some models are made with molded, allowing the user to sit while showering or steam bathing. The other features included in most models are ceiling rain, hydro-massage jets, a movable hand shower, a fog resistant mirror, an exhaust fan, and a remote control panel. Its large, bulky, and spacious design is ideal for large bathrooms.